After two straight weekends of blockbusters that didn't exactly bust the blocks, we have a can't-miss entry in the summer Sweepstakes. Shrek 2 hits all the buttons for a film that's set to make a huge (ogre-sized) impression on the box office. It's practically a cliché at this point to note that computer animation has elbowed traditional animation out of the movieplex, with even Disney abandoning the process. It seems somewhat like the transition from black & white to color filmmaking, except faster and with a more marked box office trail. I firmly believe it'll come back in small doses as something of a novelty, perhaps like 3-D, but for now, computer animation rules the roost. Shrek's release in 2001 was a big part of that transition as it showed that companies other than Pixar, which to that point had a virtual lock on the proceedings, could be successful at CGI animation. DreamWorks' riff on fairytales came out as a bit of an underdog in May of that year, but managed to open to $42 million the week before Memorial Day. After that weekend, though, the fun began as it managed to bring in a higher number over the following holiday weekend and kept rolling through the summer to the tune of $267 million as well as winning the initial Academy Award for Animated Feature. I've expressed my dislike of this picture numerous times; that it out-grossed that year's Monsters, Inc. and beat it out for the previously mentioned award is a travesty, and it reinforced the incorrect notion that Mike Myers' "Scottish" accent is funny. I could continue on for pages and pages but it would miss the point and really, this is my problem; I'll work through it. There is clearly an avenue for this type of humor out there and it's not so much offensive as it is mediocre, which is practically a strategy for filmmaking these days. The sequel finds Shrek & Fiona celebrating their marriage by visiting her parents (voices of John Cleese and Julie Andrews), who are unaware she's turned into an ogre (you send kids away to college and you never know what you'll get back). Wackiness then ensues as Fiona has actually been promised to Prince Charming (voiced by Rupert Everett, whom Fiona really ought to know a couple of things about). 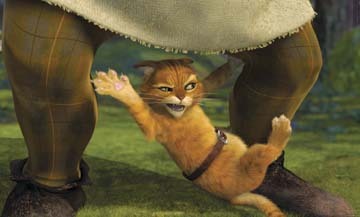 We also have the appearance of Puss-in-Boots as a swashbuckling counterpart to Shrek, voiced here by Antonio Banderas. Eddie Murphy returning as Donkey rounds out the important cast. The plot isn't so much original as it is done to death, though I suppose the point here is how they tweak the ideas, rather like a 90-minute Saturday Night Live skit. "Hey, what if they were all fairytale characters?" The sequel has gotten better reviews than the first, which wasn't exactly panned itself. Most are claiming as well that it is better than the first (damning with faint praise for me), meaning that the film shows every evidence of being a monster hit (sorry) of the early summer. It's actually starting on Wednesday, the first early jump of summer, which should take some of the business away from what might otherwise be a record-breaking weekend. It still may reach those goals, as the box office pattern for computer-animated features has been on a constant climb since Toy Story debuted in 1995, up to Finding Nemo's debut at $70 million last year. In five days, Shrek 2 should approach and perhaps surpass $110 million, with approximately one-third of the total coming before the weekend. The $70 million opening weekend figure of Finding Nemo is definitely in jeopardy. Troy won the box office last weekend, but this type of victory would be more familiar to Pyrrus than Achilles, as the enormous (estimated) $200 million budget is not entirely justified by a "mere" $46.8 million opening weekend. World-wide take, video, and so forth should take care of turning this movie into a money-maker; however, you definitely get the feeling that this is not the kind of performance Warner Bros. was expecting from a Brad Pitt historical epic. It's likely to play better over a longer period during the summer than some other films coming down the pipe. Still, while we can't forget that $46.8 million is still about 30% better than the similar Gladiator's opening number, Troy suffers under the mantle of Increased Expectations. Look for around $27 million for weekend number two. Van Helsing, on the other hand, is in danger of having its box office sucked dry. Dropping almost 60% after its debut, it's made an early claim on the 'one and done' championship trophy, presented annually to the summer blockbuster that has the highest proportion of box office in its first weekend (last year's winner: Hulk, at 47%). It's probably just as well, since they managed to run through the entire back catalogue of Universal monsters in this one, leaving the prospects for villains in a sequel as the real scares. Watch for it to fall beneath the $10 million mark this weekend. Mean Girls is the last remaining hanger-on of note for pre-summer films, falling just 25% after an initial 44% plummet. We're looking at about a $75-80 million final figure here, accounting for the fact that this is the main draw for the teen girl audience right now and with the caveat that Shrek 2 should also cross-over into that market. What it really means is that for now, Lindsay Lohan is the unquestioned champion of the pre-teen Battle Royale. Super Size Me made an expected jump nearly into the top ten last weekend, falling just a quarter pounder million or so short. This weekend might be the one where it makes it, as only one new wide release opens, and several films at the bottom of the top ten are nearing the end of their runs. The provocative documentary on fast food culture is set to be the buzz activist film of the summer; at least until that meany Michael Moore steals all his thunder from Cannes. Coming from almost entirely out of nowhere, A Day Without a Mexican made the top 15 on just 53 Southern California screens. A fantasy comedy about the sudden vanishing of all Latinos from California, it achieved an impressive $11,000 per-screen average. It does not look at this moment to be expanding dramatically this weekend; however, the surprise nature of the film should be enough to attract buzz and keep it afloat. The coming weeks will tell if the social satire can really catch on and build an audience, My Big Fat Greek Wedding-style.